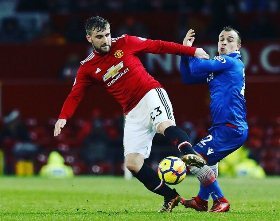 Through a press release, Manchester United have confirmed that England international Luke Shaw has committed his future to the club by penning a new contract. The new deal will keep the left back at Old Trafford until June 2023, with the option to extend for a further year. Speaking on the new contract, Shaw said to United's official website : ''Since I came to United, it’s been a whirlwind four years that have passed so quickly. The 23-year-old joined Manchester United in the summer of 2014 after spells at Southampton, where he spent 11 years, Hersham and Molesey Juniors. This season, Shaw has played seven matches in the English Premier League, scoring one goal.